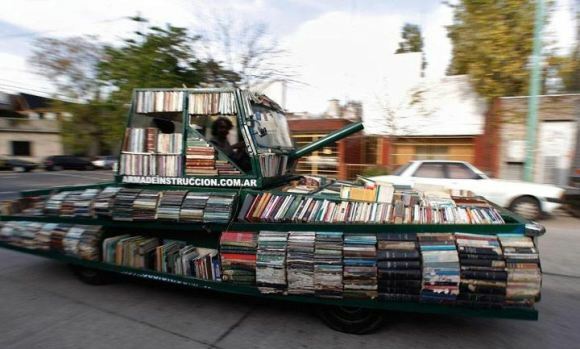 Raul Lemesoff has developed a literary tank called Arma De Instruccion Masiva“, or “Weapon of Mass Instruction.” He built it from a welded frame atop a 1979 Ford Falcon, which was a vehicle popular with the then-ruling military junta. Raul will pull over for anyone asking for a free book! Motorcyclists and pedestrians will even take books off his car while he’s stopped at lights. Lemesoff explained his project to the AFP, “The Weapon of Mass Instruction is meant to get people to recognize various aspects of life; sharing, and education, and also to have a good time.” Lemesoff’s art work has led him to bring books to remote impoverished towns where, according to the AFP, as many as half the children may not have gone to school. 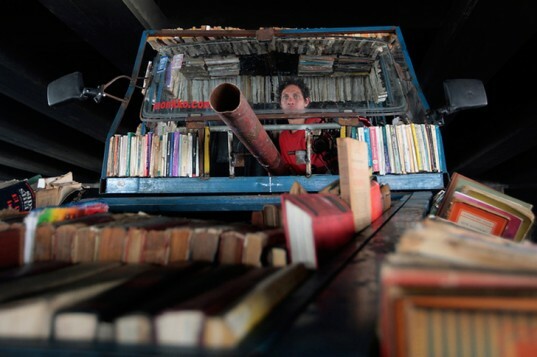 Having toured large areas of the country in his extraordinary vehicle, Raul Lemesoff now has his sights set on delivering free literature, in his own distinct style, to Peru and Bolivia. This reflects at least 3 aspects of Argentina- its mordant sense of humor, its difficult history, and its abundance of books. Buenos Aires has a lot of really good bookstores- or at least it did. I don’t know if many bookstores in BA have closed as they have in New York City, with the advent of e-books.